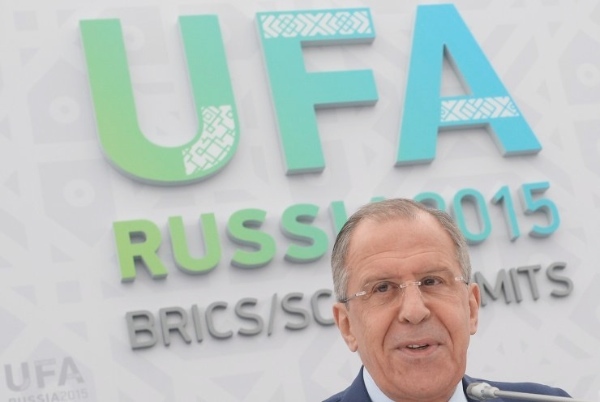 Moscow will push for BRICS to uphold its primary function for which the alliance was forged, to safeguard economic interests of the five nations, Russian Foreign Minister Sergey Lavrov has stressed. “It was formed to uphold the interests of these “new countries” in the framework of international financial relations, including the IMF and the World Bank. It’s not some whim but a reflection of objective reality,” Lavrov told an audience at a Russian University in Moscow on Tuesday. The New Development Bank and a monetary fund, launched by the BRICS “will be backed by one hundred billion dollars each, which will allow BRICS to act more independently and effectively in implementing the projects that are deemed mutually beneficial by its association members” said Lavrov. “Since 1990, the share of the United States, the EU, and Japan in the global GDP has decreased sharply, whereas the share of the BRICS economies, if I’m not mistaken, has grown from 7.7 percent to 22 percent – that is, it has tripled. The share of BRICS in the global GDP has grown at the expense of a comparable reduction in the share of the United States, the EU and Japan,” Lavrov claimed. The BRICS bloc is “actively pushing” for IMF reforms while “these decisions are now being blocked exclusively by the United States” charged the Russian Foreign Minister. As the BRICS countries launched new financial institutions like the $100 billion BRICS Bank, the China-led Asia Infrastructure Investment Bank, and a $100 billion BRICS currency reserve fund, the IMF has once again delayed voting reforms to give emerging countries greater say. “Reforming the international monetary and financial system to make it more equitable remains high on our list of priorities within BRICS,” Lavrov said on Tuesday. A statement from the International Monetary Fund in June said the board has postponed the discussion on how to move forward without Washington. The board will now take stock of the situation in September. IMF Chief Christine Lagarde had last year hinted at a “Plan B” if the US failed to endorse the reforms by the end of 2014. Both the China-led AIIB and the BRICS Bank have been gaining popularity and are seen as a counterbalance to the IMF and World Bank. The US and Japan have not applied for the membership in either of the new development banks. The IMF quota reform calls for a 6 per cent shift in quota share to emerging economies. It will lift China, which still has less voting power than the Benelux countries ( Belgium, Holland and Luxemburg), to the third largest shareholder. Shares for Russia, India and Brazil will also see hefty rise. Meanwhile, the BRICS foreign Ministers will meet on the sidelines of the United Nations General Assembly in September in New York. Russian Foreign Minister Lavrov confirmed that documents will be adopted at the BRICS ministerial meet in New York that “reinforce our common approaches to key international policy issues, including with regard to the Middle East, and certainly, our negative attitude toward unilateral sanctions”. The corruption in the international financial system is in full view. The lawyer for the Global Debt Facility that contains the world’s monetary gold reserves has filed commercial liens against the parties that have been preventing her from bringing the International Bank for Reconstruction and Development and International Finance Corporation into compliance on the world’s securities markets. Ever since 2012, when Karen Hudes was reinstated by the Board of Governors of the World Bank and IMF, and the UK Parliament published her reports of corruption, the Network of Global Corporate Control has been doomed, as predicted by an accurate power transition model that came to the World Bank in 2004 from the US Department of Defense. This means that the usurious fiat currencies issued by the insolvent Federal Reserve Bank and the rest of the members of the Bank for International Settlements are going to be replaced with currencies minted out of the gold allocated by the Board of Governors of the World Bank and IMF in a global currency reset. Country debts are going to be offset against the more than 2 quadrillion which the private central banks owe to the Global Debt Facility. Hello Karen, that is very interesting and I sincerely hope it comes to pass. Do you have any time frame, an educated guesstimate for when the MSM will start reporting the truth, and for when the new gold-backed currency will be available? Do you mean that my city government will make it available or will WA state print their own asset backed currency? How will this play out for citizens? I have read much of your information, thank you so very much for all the work you are doing to help, even if the majority of U.S. citizens are clueless to the state of affairs. If the BRICS nations would open their retail banking for small depositors around the world, including in the USA, I suspect that there would be a huge private individuals demand for normal savings and checking accounts by those currently suffering under excessive and abusing financial practices. Just simple respect for individuals, some integrity in money safe keeping, possible some investment opportunity to participate is projects as investors, and a decent banking honesty would suffice to draw in all sort of capital, to be exchanged instantly upon deposit for denomination in BRICS currencies. WOW RICK!! WHat a fabulous idea! On a smaller scale, but equally frustrating is to sit by and watch the non-sensical or maybe purposeful slaughter of what so many have worked so hard for,desperate to see succeed, not just for the quality of life for the current generation but hope of survival for our future generations. Watching our dreams never come to reality and NO CONTROL to change it! What we sew we shall reap…in spades I hope! Bring on the BRICS bank for us working people….but why are they meeting in NY state? Seems an easy place for sabotage by the dark forces. The US banks will never give up willingly. They will need to be crashed and dissolved by China and Russia. These criminals have no consciousness to feel or see any light. For us, it’s not just about the money. It’s about the chem trails, the poisoned food and water, and all the rest of it. I don’t want what they offer, including the bad health care. I won’t pay for it. I know many people who are simply not working much now….they aren’t on fed subsidies, but they have lowered their living standards to maintain some independence. I don’t even think about those on food stamps anymore…..nothing I can do for them. It’s too late to change anyone not with what’s coming. Well said. I feel exactly the same way. I’ve taken the view, the world will do as it will, so will I. Every day I see new information that confirms we are not in a good place. It’s time to prepare for the unknown, stay quiet (people just won’t listen) and do something good for somebody, even if there’s no gratitude. And now we have a coup in Brazil, the US will never allow its strangle hold on the rest of the world to be usurped, they will risk nuclear war to keep that from happening. There is a part of me that thinks the elites in the US would like that, reduce the population to a hungry, compliant few, destroy the armed forces and cities of some of its rivals, then rise from the ashes to offer loans and weapons to rebuild the shattered world. Your statement about the lateness in the day is right on the mark I think. I think it is time to stop “embracing” what is wrong, and to protect and surround immediate family with love and support toward their survival in the years ahead as the world goes through a massive adjustment which seems “inevitable”. In other words, “family first and foremost”. Excuse me but is this fund in us dollars? Brics is a joke. This is in response to Cyndy Lystad’s question earlier this month about the timing for replacing paper currencies with currencies out of gold from the Global Debt Facility. You will find out at the Annual Meetings of the World Bank and IMF in Peru on October 9-11 whether we are all going to descend into WWIII, or whether the global currency reset is going to be implemented. The global currency reset was agreed six months ago by the Board of Governors of the World Bank and IMF that administer the Global Debt Facility in the Spring Meetings. The Global Debt Facility is now enforcing the liens on the personal assets of recalcitrant double agents serving the Network of Global Corporate Control instead of their constituents. Thank you so much for answering my question! It took me some time to get back here, but I’m so glad I checked back. I am not good at reading between the lines. What happened in Peru in October, was it good news or bad news? Are we moving towards the Reset, or more towards WW3? I think by other indications we moght be moving towards the reset. There are recent actions by the Obama administration that seem to be concessions or reversals or past policy. Can you please give us an update? I value your opinion and you are right in the thick of it.